After two months off from writing on this blog I’d be loathe to write about anything new. I’ve got a heck of a backlog of stuff to get through. 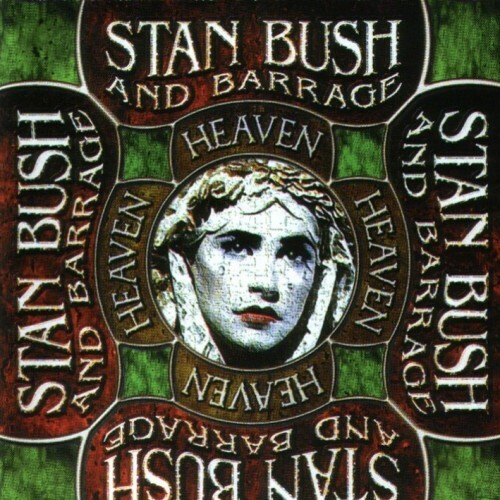 But right now I want to write about Stan Bush‘s second album with Barrage titled Heaven from 1998 (and recorded waaaay earlier). To me and probably 95% of his fanbase, Stan Bush is always going to be the guy that wrote “The Touch” (or as it’s sometimes incorrectly referred to as: “You’ve Got The Touch”). It was his biggest hit and as he has fallen into the habit of re-working, remixing and re-recording it on his last few releases. (most recently The Ultimate which I wrote about here.) What’s nice about this record is that it was recorded in the late-80′s/early-90′s before Transformers-fuelled nostalgia (or Boogie Nights-fuelled nostalgia) turned Stan into the fan-pleasing powerhouse he is today. (and that’s not a knock. I *love* Fan-Service-Stan) Heaven stands on its own without trying to mimic older hits. Bush’s first record with Barrage, the self-titled Stan Bush & Barrage is regarded by Stan Bush purists as his finest. (an aside: I’d love to meet a Stan Bush purist. We’d have so much fun together!) I beg to differ. Heaven is even better! The album highlight is the second track: “Cross That Line” which could attain that title based on its intro alone. In just over forty seconds it manages to deliver 1984-era Van Halen synths, Brian Eno swells, dirty cowbell and a guitar riff that would make Tom Scholz proud. Then the song starts. Throw in some crunchy numbers like “Joanna” and “Dreamin’”, one sing-along ballad in “Love Don’t Come Easy”, and the so-catchy-I-want-to-kill-it “Hard To Find An Easy Way” and you have a delightfully shlockey AOR classic. Timeless it ain’t. But I’m a child of the 80′s and I love this stuff.